Brian E. Jackson is an assistant professor and co-director of the Horticultural Substrates Laboratory in the Department of Horticultural Science at North Carolina State University. This is the last article in a three-part series highlighting some of the potential challenges with using wood substrates in greenhouse crop production. This is the second article in a three-part series highlighting some of the potential challenges with using wood substrates in greenhouse crop production. International Growing Media Symposium Comes to the U.S. This International Symposium, with representatives from 21 countries, covered new market opportunities, generated innovative ideas, and offered first-hand information to more than 150 attendees. Growing media formulations are evolving as researchers fine tune blending techniques for wood component substrate alternatives to achieve reliable, consistent results. 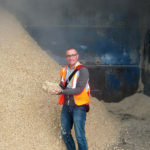 In the last of a four-article series highlighting the production and use of pine wood chips as aggregates in greenhouse substrates, the researchers found growers do not need to adjust their production practices when 20 percent pine wood chips are used as a perlite replacement. This is the third article of the four article series highlighting the production and use of pine wood chips as aggregates in greenhouse substrates. We found growers do not need to adjust their production practices when 20% pine wood chips are utilized as a perlite replacement. This is the second article of the four article series highlighting the production and use of pine wood chips as aggregates in greenhouse substrates. In the first of a four article series highlighting the use of pine wood chips as alternative aggregates to perlite in greenhouse substrates, researchers from North Carolina State University discuss the processing and physical properties of pine wood chips.